"How does that kind of height make sense at this location?" Marx Brothers Playground site - 96th Street and Second Avenue. The Metropolitan Transportation Authority is finally moving out of the playground after "temporarily" occupying 0.5 acres of the 1.5 acre park since 2007. The MTA paid $11 million to the Parks Department as mitigation for allowing the public park to be used as a staging area during Second Avenue Subway construction. They also paid the salaries of Parks Dept. Playground Associates at several area playgrounds. The MTA is legally required to restore the playground. (Photos: Geoffrey Croft/NYC Park Advocates) Click on images to enlarge. But now the De blasio administration is claiming the Parks Department has no juristiction over the 1.5 acre park even though the city is attempting to Alienate the park land with the help of the State legislature. The city is trying to build a one billion dollar development at the request of the City Council Speaker. The Educational Construction Fund (ECF) has come up with a scheme to dramatical increase the size currently allowed. 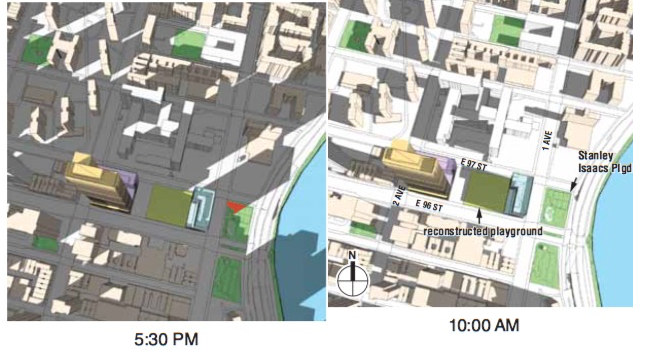 The massive tower would cast shadows as far as Central Park according to project documents. The Department of City Planning voted to appove the controversial plan on Wednesday morning. Proposed East 96th Street & 2nd Avenue. A rendering depicting just a few floors of the massive, 760 foot residential tower. This irresponsible development would be built on Marx Brothers Playground critics say. The community is demanding that the playground be restored to its original location at 96th Street & 2nd Avenue, and a sensible plan be developed. 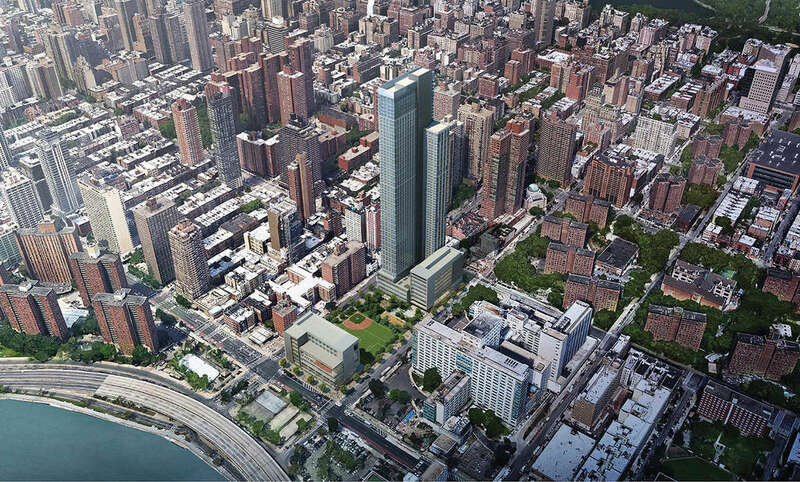 Upper Eastside and East Harlem residents are fuming over a $ 1 billion dollar proposed development being pushed by City Council Speaker Melissa Mark-Viverito on the border of the two neighborhoods. The plan would hand over Marx Brothers Playground to a developer to build a massive 760 foot tower with 1100 apartments, three schools, and retail space on the corner of 96th Street and 2nd Avenue, a project the community refers to as The WALL. At 760 feet it would be the tallest building north of 60th st. and taller than any building in the other four boroughs. A height area residents say would be egregiously out of context with the community. Since it is illegal to build on public parkland for non-park purposes and since parks do not have zoning, the city is attempting to get around this by having New York State legislators temporally seize (Alienate) the park to allow development by creating commercial zoning. This would set a very bad precedent, one that could open the floodgates and, at a minimum allow the development of not only every single one of the approximately 250 Parks Department Jointly Operated Parks properties it shares with the DOE throughout the city, but ALL parks could be subjected to development if this proposed legislation is passed. Literally NO Public land would be safe. The massive 1.1 million square foot project would encompass an entire city block. Open Sky. The site on May 10, 2017 - without the massive development. The alienation of a public park in order to generate development rights is a circumvention of the Zoning Resolution’s regulations that preclude public parks from having development rights. When re-build under the new proposal the playground would be in the shade for most of the day. The Speaker has partnered with the Educational Construction Fund. The original 2012 plan envisioned only one school - Co-Op Tech which is already on the block. 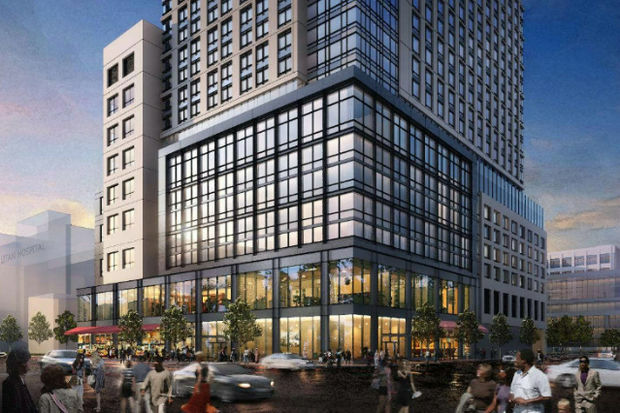 ECF already had a signed agreement with developer AvalonBay according to the head of the ECF who says the scope of the project changed dramatically in 2013 when City Council Speaker Melissa Mark-Viverito insisted that three schools be built there. “A lot of the factors changed over the last three years at the request of the Speaker’s office we were asked to move the two additional high schools into the parcel so that changed the design obviously,” said Jennifer Maldonado - Executive Director of Educational Construction Fund/Special Assistant to Deputy Chancellor testified before the City Planning Commission on May 10th. According to ECF the plan would also allow the Julia de Burgos Cultural Center, a long time important project of the Speaker's, to expand. The center, located on Lexington Avenue and 105th Street, currently shares space with Heritage, one of the two new schools the Speaker is hoping to move to 96th Street. "The use of the entire building by the Cultural Center is a strong priority for Speaker Mark-Viverito," ECF wrote to City Planning in a 92 page response obtained by NYC Park Advocates. Neighbors who live on 96th Street and south are also furious because they say they have been left out of the discussion and point out that most of the impacts will be felt there. The project is already making its make through ULURP. The 2004 parkland alienation language that allowed the MTA to use the park for building the Second Avenue Subway explicitly stated that upon completion of construction, "the lands shall continue to be used for park purposes." However this administration has other ideas. They have gotten the State to introduce Alienation legislation to block that. "Construction of the second avenue subway is completed and the city of New York would now like to turn over the block on which the playground is located to the New York City Educational Construction Fund to permit the construction of a combined occupancy structure." After a ten year absence, the community expected the city to being rebuilding the city playground later this year after the MTA vacated the property in September. The land was used as a staging area to build the Second Avenue subway during this time. According to the new plan after all 1.5 acres of parkland are seized and developed the land between buildings would be rebuilt for use as a public park. The residential tower is not anticipated to be finished by 2023 which means the community’s playground and heavily used artificial turf field - much of which will now be shaded by a massive tower for a good portion of the day - would not be available at least an additional five years. Under the terms of the 2004 parkland alienation bill the MTA is legally required to restore the playground. However on May 10th, Jennifer Maldonado testified before City Planning that there was no money for Marx Brothers Playground. According to ECF they, along with AvalonBay will contribute approximately $ 8 million for the renovation and upgrading of Marx Brothers Playground. A Walk In The Park asked the Parks Department what the status of the MTA funding was. Requests have not yet been returned. The De Blasio administration is now claiming the 1.5 acre park isn't even Parks Department property. The massive 760 foot tower being spearheaded by the Education Construction Fund through the city planning depends on a State Parkland Alienation legislation to achieve its goal. Adding to the theatre of the absurd the City is now claiming the park is in fact not a park and does not belong to the Parks Department and development is already permitted under its current zoning. In its 92 page, at times laughable response to City Planning, the City repeatedly asserts that Marx Brothers Playground is not parkland. But it is covering its bases. “Although the Marx Brothers Playground is not and has never been parkland, the City and ECF have determinted that in connection with the Proposed Project, it si prodent to obtain new legislation. Keeping It All In The Family. The designer of the proposed new park, Stephen Whitehouse, a former chief of planning for the Parks Department claims in his letter to City Planning that the new park location - beside the 760 feet building - is safer because they plan on raising the park a foot higher in order to get it out of the 100-year flood zone. For the past sixty plus years the playground has been safely dry on Second Avenue. Jennifer Maldonado - Executive Director of the Educational Construction Fund/Special Assistant to Deputy Chancellor testifed at City Planning on May 10, 2017. The original plan she said called for one school but according to Maldonado Speaker Viverito dramatically changed the scope of the project when she insisted three schools be build on the site. Under the plan ECF would float a bond to pay for the school construction. (Photos: Geoffrey Croft/NYC Park Advocates) Click on images to enlarge. The billion-dollar project depends on State parkland Alienation legislation approval to achieve its goals. Jennifer Maldonado - Executive Director of ECF said they met with all the Assembly members, parks committees, two days before the May 10th hearing. "We actually have legislative language to alienate the playground. We have both Senator Serrano and Assemblyman Rodriguez's support. Senator Serrano will take the bill up for vote," Maldonado said. Assemblyman Robert Rodriguez had a conflict NYC Park Advocates later learned. Rodriguez is a Vice President at A.C. Advisory, a company that is involved in bond financing for ECF projects. A.C. Advisory is listed as the financial advisor to New York City and related authorities in the placement of bonds. Is his employer, A.C. Advisory, Inc., acting as the financial advisor in the placement of the bonds financing for this project? By press time we were unable to verify that or whether or not he would be recusing himself from voting if the bill comes to the floor. But Assemblyman Rodriguez did fail to disclose that conflict when a group of constituents met him at his office last month to discuss the project. After three days of calling his office two weeks ago A Walk In The Park got a call back saying that he was not pulling out. However in his place the City enlisted Bronx Assembly member Michael Benedetto - who represents the North East section of the Bronx to carry it for the Assembly. He also heads the influential City Committee. The de Blasio administration has been lobbying heavily in Albany according to several State officials. State Senator José M. Serrano also quietly introduced the bill last week. Ms. Maldonado said she is hoping the bill makes it through this session. State Legislators could vote on the bill as early as today. The city quietly passed the bill's Home Rule message last week during its stated meeting. During the May 10th hearing Planning Commissioner Anna Hayes Levin pushed back on the numerous goals for the playground. “Clearly there are a lot of very good public goods being planned for this site - no change in the playground size, three news schools, permanent affordable housing, but that comes at the cost of a building that is 724 feet tall," she said. "You may call it 68 stories but in linear terms that’s 72 tall. That’s almost as tall as the Time Warner Center,” Commissioner Levin said. "How does that kind of height make sense at this location," Levin asked. "As we've talked through the assemblage and the constraints on how the site needs to be actually configured, up is the only way to go, quite honestly," Maldonado responded. "Are we asking the applicant, the developer to carry too many public goods into this project. Are we producing a building that makes no sense in terms of its scale," she countered. "I would say no I think that in terms of you know what we are trying to do. I'm not sure if there is a right answer quite honestly, to be honest with you," Maldonado replied. The ECF head then attempted to justify the funding scheme and the reason why the city and state are pushing to give the public parkland to a private developer, and in the process allowing AvalonBay to assume the role of government. "There are no capital dollars available for these schools to be frank. There are no capital dollars, this is not on DOE's list, there's no capital budgeting allowed for these schools. This is the only way these schools will happen," Maldonado said. “The only way we can keep these schools operational is to use the playground," she said. Shade. The playground and heavily used field would be replaced mid-block and covered by shade from the towers for a greater part of the day. The massive tower would cast shadows as far as Central Park according to project documents. “As a zoning attorney I am very concerned about the project, “ Caroline Harris of GoldmanHarris testified at the May 10th City Planning hearing. “It appears it achieves its huge size by using a deal structure that of temporarily transferring the playground and the rest of the block to ECF circumventing basic zoning principles. The definition of a zoning lot and the fact that public playgrounds do not have development rights." “When there is a MIH (Mandatory Inclusionary Housing) component there is a real driver to go higher than the neighborhood context. This is way beyond going higher than the neighborhood context, this is going to the Neighborhood of 57th Street context," Harris testified. "I think its way out of scale here." Several residents who live in the Speakers district on 96th Street also complain that when they finally found out about the plan and tried to ask questions at a Community Board 11 meeting in March they were shut down by the Speaker. "Does anyone from the community have any questions," several recalled her saying. "We are her constituents," said Silve Parviainen who attended the meeting. At the May 10th City Planning hearing Maldonado admitted she had not made a formal presentation to Community Board 8. Last week CB 8 fired off a letter to City Planning saying they had, "Serious concerns, " about the project. For more than 60 years children of all ages have enjoyed the unfettered access to light as result of a corner location of this playground and adjacent open field. This proposed plan would destroy that. The community is demanding that the playground be restored to its original location at 96th Street & 2nd Avenue, and a sensible plan to be developed. The massive 1. 1 million square foot development is making its way through ULURP. East Harlem has been neglected for a long time - new high schools are sorely needed. What is not needed is a shady deal with a private developer to cover up that neglect at the cost of the safety and livability of the neighborhood! This development is completely out of scope with the neighborhood. This is Midtown zoning in East Harlem! There is no plan to solve the problem of 5,000 people moving to and from the one block area on a daily basis. People living in the neighborhood are seriously concerned about the resulting traffic and safety nightmare. There will be three high-schools (none of which has East Harlem preference, so the students may be from anywhere), but what about primary schools for the residents of the new building? In addition, the project would destroy Marx Brothers Playground and Field. Right now the playground basks in sunlight and is one of the few open spaces in the area. MTA has used the playground part for staging, but is required to return it to the community and fix it to its original use. The ECF development would move the park to the middle of the block, shading the field for most of the time. Overall the behemoth project would cast shadows as far as the central Park! It is illegal to build on Public Parkland for non-park purposes for a reason! If the NY State legislators will temporally seize (Alienate) the park to allow development by creating commercial zoning no public land is safe in the city. The community does not want Midtown zoning to East Harlem! When will New York politicians stop succumbing to the influence and money of piwerful developers like AvalonBay? When will the developers stop blotting out the sky with preposterously out of context buildings that will undermine the quality of life around them? Surely the developer has held schools and affordable housing hostage to extract the profits an extra 20 floors will bring. This development brings schools and housing, both of which are badly needed. It would also bring commercial space to a fairly desolate part of the neighborhood. The building sits right on top of a subway station with massive amounts of excess capacity. If it is not permissible to build here, then where could housing ever be built in this city. Attending some of the community meetings where this building was discussed, the dogwhistle politics was out of control. People kept saying words like "safety", trying to stress that the building would make the neighborhood unsafe. I have been around this city long enough to know what it means when people claim that new housing will make the neighborhood unsafe. NYC needs to push back against this very ugly strain of NIMBY politics. Build more housing and schools so that people and families can actually live in this neighborhood. This building is as good a place to start as any. Read the facts and fiction of this monstrous, dangerous project at: https://ochrez123.wixsite.com/e96thneighbors/facts-fiction. Don’t be fooled by “new school buildings” and “affordable housing” used as bait to steamroll Council Speaker Melissa Mark-Viverito’s short-sighted pet projects. All at the detrimental expense of the health, safety and well-being of the residents in the area and so many children who use the historical Marx Brothers Playground. Why did Assembly Member Robert Rodriguez initially fail to disclose such blatant conflict of interest? Why is the de Blasio administration “lobbying heavily in Albany”? Why is State Senator José M. Serrano introducing the State Parkland Alienation legislation when he should be protecting such state parkland, not destroying it? Why are New York City and State government officials jumping through hoops to aid and abet an out-of-state mega private developer make more profit by taking over our precious parkland? It’s shameful that the de Blasio administration is blatantly on the wrong side of such an important issue that affects so many residents in the area (and possibly the entire City). Setting a dangerous precedent by introducing the State Parkland Alienation legislation for a private development project is a huge blunder--voters will not forget this during the November elections. We need to maintain the integrity of this community. This project is out of character with the neighborhood, violates zoning laws, creates dangerous pedestrian issues especially for students in the proposed schools, and general overcrowding. This is an obnoxious development in the literal meaning of the word-- objectionable, unsavory, frightful-- and it should be getting MUCH more coverage and condemnation in the media. Where is objective reporting in the New York Times? Where is television news coverage that could provide the public with a picture of showing the towering height and already crowded streets? Where is NPR, usually known for courageous local coverage of community conflict? Who is covering the way powerful real estate developers have co-opted with council members and assemblymen who want take credit for schools and affordable housing--housing which the developer is WILLING AND ABLE to include without going up higher than any building for fifty blocks. Where is the newscaster who will express outrage at the sacrificing of a park for private gain; the multiplying of congestion many-fold; the casting of an entire neighborhood in shade. A spotlight should be cast on the campaign contributions these council members and representatives have accepted from the real estate developers; and on the process which has been been skillfully subverted. Reporters, please pay attention! !